My family loves garlic, if you do as well this recipe will be a favorite. Becky, a neighbor of my parent’s, gave them this recipe that her dad learned in Italy while they lived there for a few years when she was young. In her family, this recipe is served as a side dish along with grilled sausages or another piece of grilled meat. In our family, we serve it as a main dish the majority of the time and it’s still loved by all. Now, the recipe has you strain the garlic and red pepper flakes. Don’t toss them! We like to keep them one the side and those that really love the garlic flavor and want a bit more kick actually add it to their serving of pasta. In a saucepan heat oil, pepper flakes, and crushed or minced garlic on low heat. Watch the oil as it can burn easily. Cook about 10-15 minutes. Strain out the garlic and pepper and set to the side. Bring water to boil and cook noodles according to package directions. Steam broccoli to desired doneness. When everything is done, add the broccoli to the pasta and drizzle with the oil mixture (can use the garlic and pepper, toss it, or serve on the side). This entry was posted in Main Dish on February 14, 2014 by Deanna Michaels. lol! I hear you – before bed snack! It’s tasty and fast. I think garlic makes most anything better! Glad you thought it sounded good! Hope you guys enjoy it. The tree is fun – it adds a little bit of character to our table. 🙂 I love flavor and budget friendly menus! Seems simple and tasty!! We usually serve broccoli alongside our pasta. Visiting via DoTell Tuesday. You are right, it is both of those! Thanks for stopping by and commenting! This looks so good. I’ll be pinning it for later use! Glad you think it looks good! We really enjoy it and hope you guys do as well. This sounds fabulous. 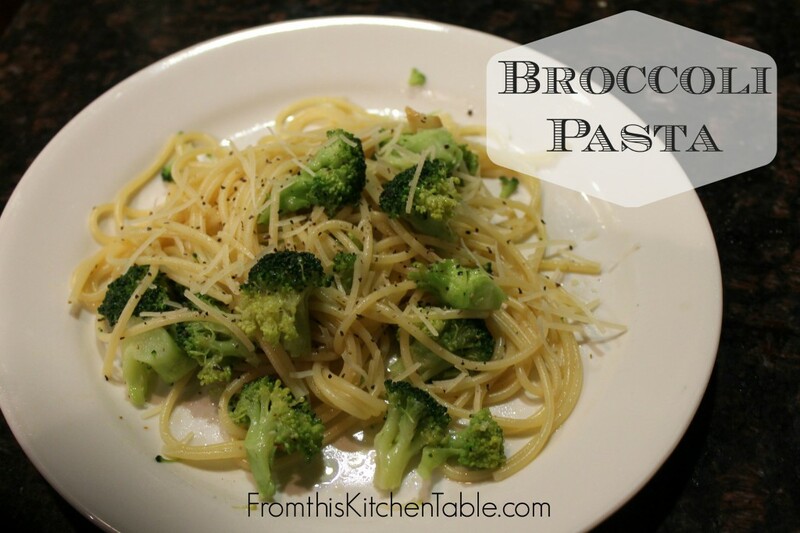 I’m always looking for some meatless recipes and pasta and broccoli are always a hit here. Especially with garlic and red pepper flakes. We love garlic and red pepper too and broccoli is my daughter’s favorite! Hope you guys enjoy it. Thanks for stopping by! It’s 10:00pm and I want to go make some of that right now. You hit on all my favorites. Yum yum! It is pretty tasty! We love garlic in our house! Ooo, thanks for sharing about your Blog Hop! I’ll have to check it out. Have a great week. Yummy! We love garlic too! I will have to give this recipe a try soon!! Very soon!! Thanks for linking it up this week for MMM link up party! I am sharing it tomorrow on the Adventures in Mindful Livings FB page! Isn’t garlic one of the best things ever?! Hope you guys like it too. We just had it for supper again last night. Thank you for hosting each week and for sharing! Looks great! Thanks for linking up at the Let’s Get Real Blog Hop! It is super tasty and simple! It was our supper last night using leftover noodles. Mini roasted potatoes sound fabulous! Thanks for stopping by, I always enjoy seeing your comments. 🙂 My dad travels to Australia several times a year and growing up we had some of his colleagues from Australia over for dinner. It was always fun. This looks simple, healthy, and delicious! I love finding recipes like this since it’s a great way to get more veggies in my diet. I’m pinning this to my dinner board right now! I’m stopping by from The Weekend Wind Down party. It is all of those things! I love how quickly it comes together and yet it still has good flavor. We had it again this week with leftover noodles from another meal. Thanks for pinning and stopping by. Have a great week! Simple and fairly healthy! 🙂 Win! Thanks for joining the WWDParty again! I agree! That makes it about the perfect recipe. We had it again last week with leftover noodles from another dish. Thanks for hosting. This looks like a deliciously healthy recipe that I am looking forward to making in the near future. Thank you for linking up and sharing with us at the #WWDParty. Have a wonderful weekend. Thanks! Hope that you enjoy it. It’s yummy and super fast. Thanks for hosting, hope you have a great week! Deanna….This is so something I would make for my family. I like quick and tasty. Thank you for sharing at WJIM’s Monday’s Musings. Blessings. It is really tasty! We love quick and tasty recipes too. Nothing like cutting down and time and clean up in the kitchen. Thanks for hosting! This looks really good. I like that is simple and quick to make. Thanks for linking up and sharing this at the Let’s Get Real Friday Link Party. I hope you’ll join us again. It is so good and easy! My kind-of recipe. Thanks for hosting. Yum! Simple is good! Thanks for linking up to Wellness Wednesday! I agree! Can’t go wrong with simple especially when there is garlic involved. Have a great week!